Once you have selected canceled accounts or members without subscriptions and click find, you can export the list and email the group. ﻿Email Canceled Members a Survey - Use Survey Monkey to create a survey to send to your canceled members to understand why they left your program. What is included in the export of accounts? How do I email members who never completed sign-up or who have an incomplete account? If you want to encourage these members to complete signup, you can email them all at once with instructions on how to complete signup, and maybe a coupon code to further incentivize them. Note: Emails sent to members without subscriptions will not appear in the member's account. How do I email members that have been canceled? 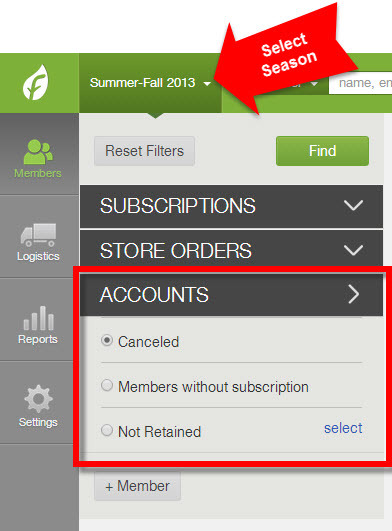 Seasonal systems can use the "Not Retained" filters to track members from previous seasons who have not signed up for the current active season. To learn more about calculating member retention, click here. What is the error message, "Member with this name already exists"?